The above photo began circulating the internet last week. No one’s really sure who took the photo, or where these people are, but apparently it was taken somewhere in Thailand. It appears as though the people are using their shoes and sandals to hold their spots in line, while they wait (sitting) on closeby benches. It’s really quite genius if you think about it. They can sit instead of stand, they’re in view of their shoes, so they can be sure no one cuts, and it’s actually an efficient, fair way of queueing. The cleanliness (or lack thereof) is the only flaw to this method. One might be weary of resting their bare feet on a public floor, but you could always carry a pair of slippers, or some other footwear to mark your spot. Either way, kudos to the people in that building. 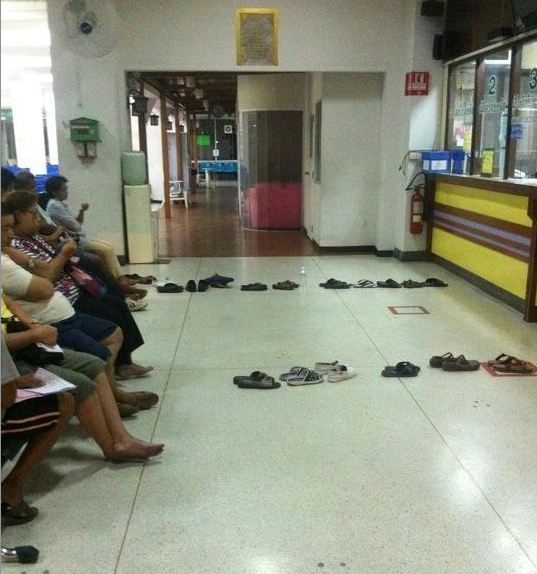 You might want to think about trying this on your next trip to the DMV…just a thought!